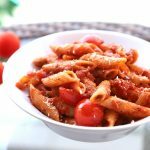 This is Penne arrabbiata or red sauce pasta recipe with step by step photos. 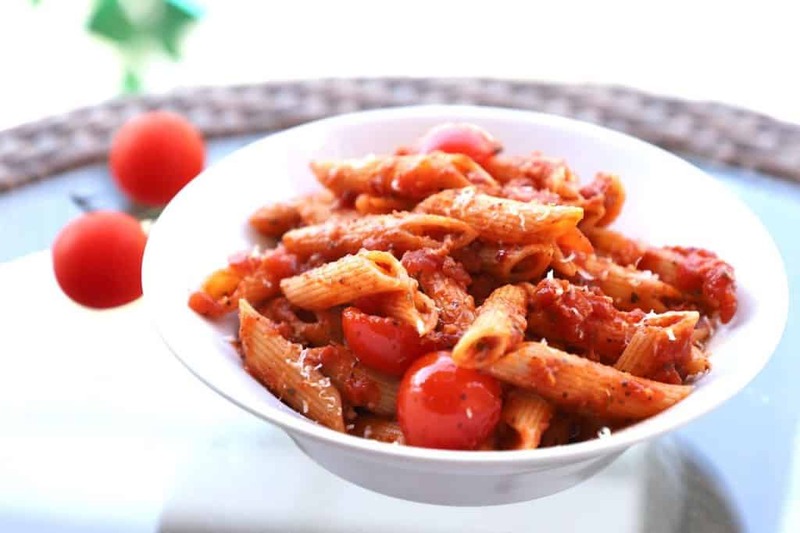 The red sauce pasta or pasta in red sauce is commonly known as Penne arrabbiata in Italy. 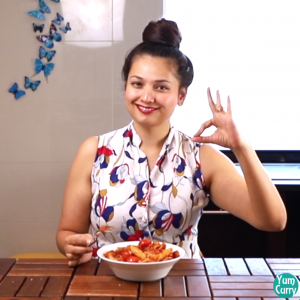 Pasta is an Italian cuisine which is served in India by adding more spicy flavours to it. 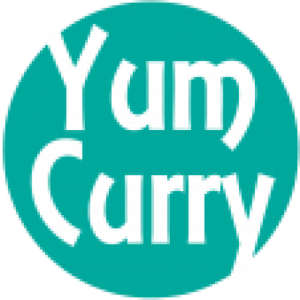 I have tried to make this pasta as Indian style pasta which they serve in street and restaurants. The pasta can be made with different kind of sauces like white sauce pasta, pesto sauce pasta and pink sauce pasta, yeah pink sauce pasta is only served in India, I think people in India find white sauce pasta very bland in taste so they came up with a new kind of pasta which is a combination of red and white sauce known as pink sauce pasta. 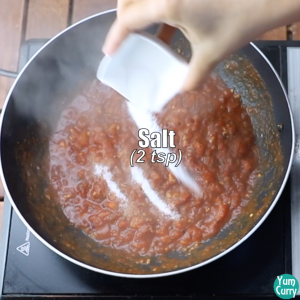 These are the most common pasta sauce. 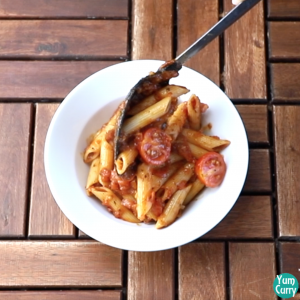 I have made penne pasta in pesto sauce which is green sauce pasta, do check out the recipe. 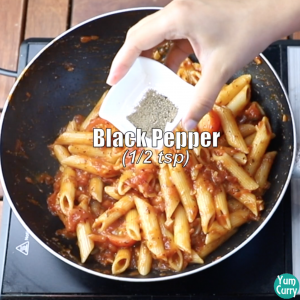 Some other pasta sauces are bell pepper sauce pasta and mushroom sauce pasta. They also tastes super yummy. 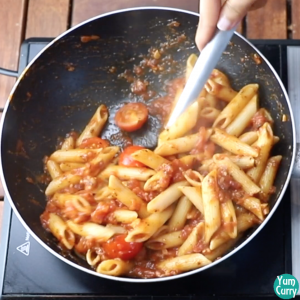 My favourite pasta is red sauce pasta or penne arrabbiata and penne in pesto sauce. Penne arrabbiata takes a little time to make as it requires boiling the tomatoes and then preparing the sauce, on the other hand pesto pasta is quick as you just have to put everything in the blender and mix it with the pasta, so when I am in hurry and craving for pasta, I always end up making penne in pesto sauce and also I love the taste of basil. Penne arrabbiata or red sauce pasta is also called vegetarian pasta in Europe as it only has tomatoes. One more pasta which I love to eat in Europe is Bolognese pasta which is pork based pasta. If you are a non vegetarian I would suggest you to try this pasta, its super yummy. 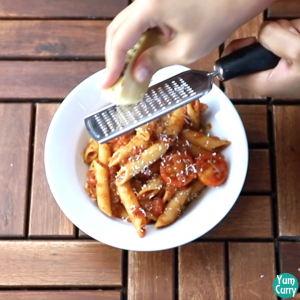 I hope you like this red sauce pasta recipe from my kitchen. Please like, comment and share it with your friends and family. Enjoy! 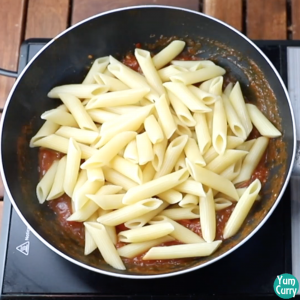 Boil the penne pasta in water with oil and salt until it's soft. Strain it when done. 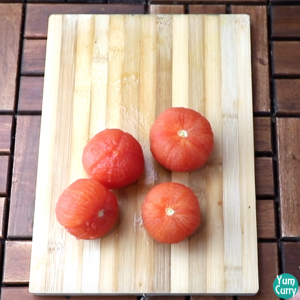 Take tomatoes and use a knife to make x mark on it (this will help to take off the skin of tomatoes after boiling). 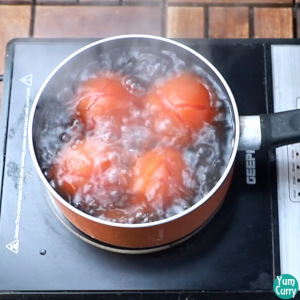 Boil the x marked tomatoes in water (tomatoes should be fully merged in water) until the skin becomes loose. It will take approximately 10-15 minutes. 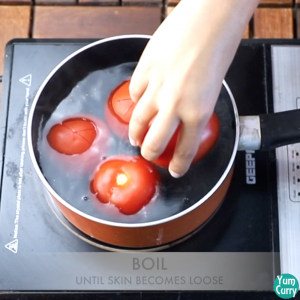 Remove the tomatoes from water when done and peel off the skin from it. Discard the skin. 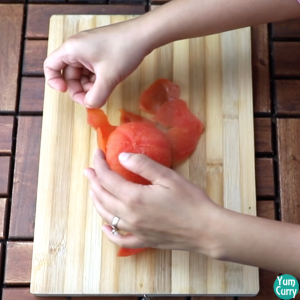 Finely chop the tomatoes using a knife and keep it aside. 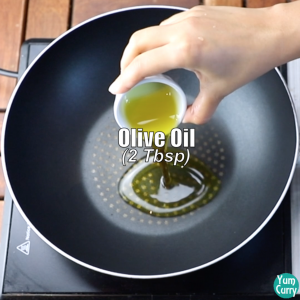 Now heat a pan/wok and add olive oil to it. 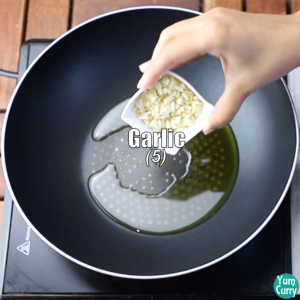 Add finely chopped garlic to it, fry it on medium heat. Add oregano, chilli flakes and basil to it. Mix well. Do not burn it. 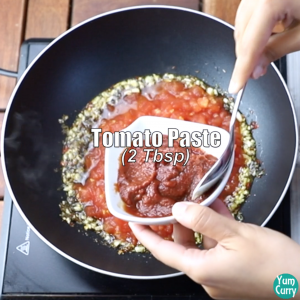 Add the prepared tomatoes and tomato puree/paste (this tomato puree is store bought puree, it give nice colour to the pasta sauce) to it and mix well and cook it for 2 minutes on medium-high heat. 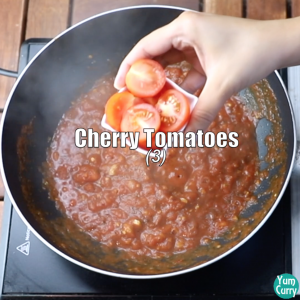 Now add cherry tomatoes and pasta to it. Mix well until combined. Add freshly grounded black pepper to it and mix. Turn off the heat. Serve it hot and garnish it with grated parmesan cheese. 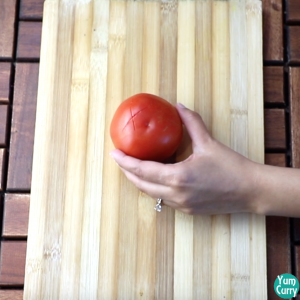 Take tomatoes and make a x mark using a knife in each tomato (this helps peeling off the skin of tomatoes after boiling). 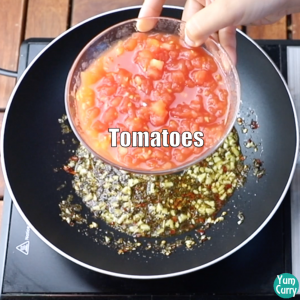 Boil the tomatoes in water until the skin loosen up (tomatoes should be fully merged into water). This will take approximately 10-15 minutes. 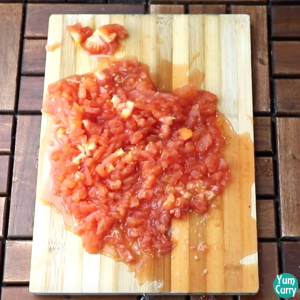 Take out the tomatoes when done and peel off the skin from all the tomatoes. Discard the skin. 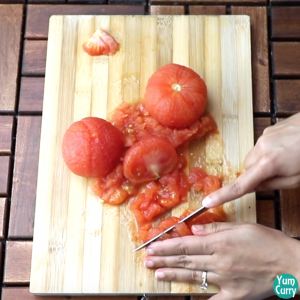 Now finely chop the tomatoes using a knife. Discard the seeds if you can. 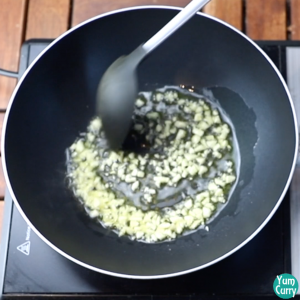 Add finely chopped garlic to it. Fry it on medium heat. 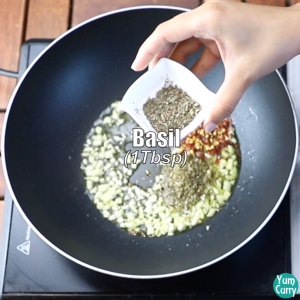 Add oregano, chilli flakes and basil to it. Mix well, do not burn it. 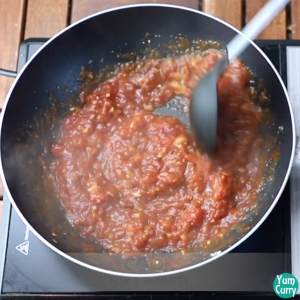 Add prepared tomatoes and tomato puree/paste (store bought tomato puree, this gives really good colour to the pasta) to it. Mix well and cook for 2 minutes on medium-high heat. Now add cherry tomatoes and boiled penne pasta to it. Mix well until combined. Add freshly grounded black pepper to it and mix well. Turn off the heat. Garnish it with grated parmesan cheese and serve hot. Enjoy!